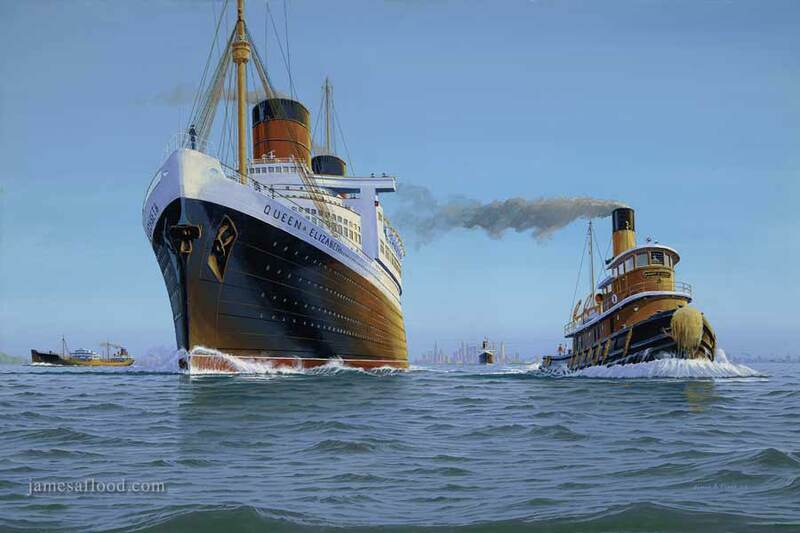 Painting of RMS Queen Elizabeth Departing New York Harbor, 1952. This painting shows a late spring morning in 1952 at the Port of New York. RMS Queen Elizabeth, having set sail earlier that morning, has now progressed down to the lower bay, abeam of Staten Island and Arthur Kill. A traditional oil tanker, cruising on Queen Elizabeth's starboard side, has just made its turn out into the open bay from Arthur Kill fairway, a tributary that gives access to Newark Bay and many oil refineries. On her port side steams one of the colorful old tugboats from the thirties. These tugboats were steam powered and relatively quiet in operation. Their handsome build and tall funnels were part of New York Harbor's charm from the turn of the century until the late fifties. In the distance, SS United States, brand new and having just recently captured the Blue Ribbon, steams against the backdrop of downtown Manhattan and Governor's Island.